Greek’s Playland is only one of the names that this place had been called over the years, and there are no signs anywhere that actually bear that name. Some know it better as Display World or the Stone Museum. 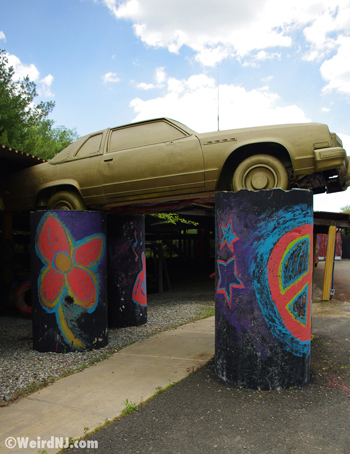 These days the moniker you will see when you enter through the vividly colored gates on Spotswood-Englishtown Road is “Garden Falls.” Around the grounds of the Playland you will find a hodge-podge of various “attractions” ranging from Cobra helicopter and M60 Army tank to a 30-foot tall brightly painted clown constructed from an old oil tank, a couple of telephone poles and assorted other refuse. 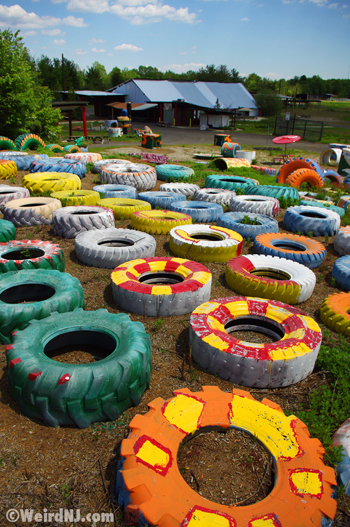 As a matter of fact, just about everything at Greek’s Playland has been recycled from something else, somewhere else. The Greek himself puts it simply enough when he tells us, “It’s all junk!” Around every corner of the winding Playland labyrinth there’s another unexpected sight to be seen, like a vast field of brightly painted truck tires, welded sculptures made from old bicycles and car parts, a miniature golf course that was designed so that the ball practically goes in each hole on its own, a disused driving range where the golf balls were once aimed at old satellite dishes, a paddleboat lake, a wooded trail festooned with hundreds of birdfeeders, a number of manmade waterfalls and other water features, pagodas and Japanese footbridges, cavernous exotically decorated banquet halls, including Mahal Gardens, a popular spot for Indian weddings, and enough parking to accommodate hundreds of cars and buses––there’s even a helipad! 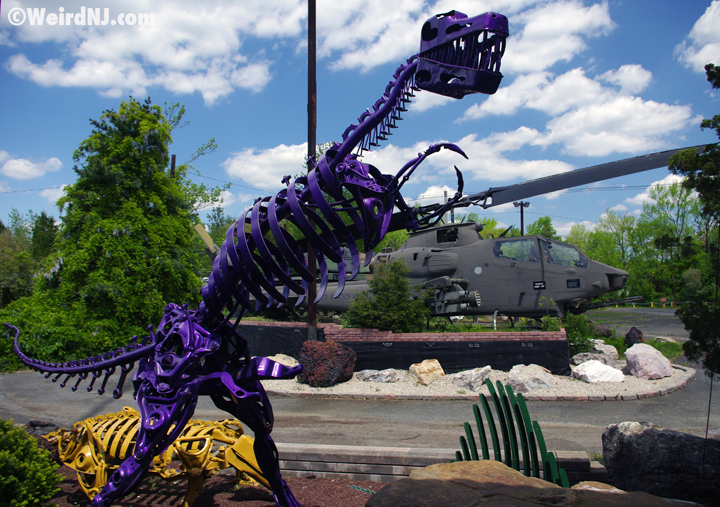 The entrance to this mad world is watched over by Monroe the Dino, a ferocious dinosaur constructed from a old tractor backhoe, that roars and drools as you pass through the gates that it guards. The place looks like a fantastically amusing park––but Greek’s Playland is not an amusement park at all really—it’s not even open to the public and never has been. So what exactly is Greek’s Playland then? That’s the question that we here at Weird NJ wanted to figure out, so we set out to find the only man who could really answer that question—The Greek himself. His real name is Spiro Drakoulakous, but nobody calls him that. Nobody even calls him by the name he shortened it to years ago, Spiro Drake. He is The Greek, or just Greek, to everyone who knows him. We visited The Greek this past recently to find out a little more about the man behind Greek’s Playland and to try figure out just what the place is all about. There’s a stone museum at Greek’s Playland that displays an impressive array of gems, phosphorescent minerals and fossils from around the world, which the public can visit for free. That’s where you’ll usually find The Greek on just about any day of the week. He’s not a tall man, perhaps standing only about 5’5”, with a thick head of bright white hair that sweeps across his tan forehead. He is well into his 80’s and is dressed in the greenish-grey work clothes a janitor might wear as a uniform. He told us that he build Greek’s Playland in 1970 as a place where handicapped children could come for the day and just have fun like any normal kids. Then he made the property available for no charge to state agencies that care for the blind, deaf, learning disabled and underprivileged. The Greek says that his real mother abandoned him, leaving him in a coal bin during the Great Depression. “But listen, at least she liked me,” he says, with his a broad smile on his lips and twinkle in his eye. “If she didn’t like me she would have left me outside and I would have froze to death.” He was raised in a foster home in Middlesex along with a dozen other kids by a woman name Elizabeth Van Fleet, who he still refers to as “Mom.” While on her deathbed at the age of 105, The Greek made a vow to Mom, promising her, “I’m going to build something in your memory––something for the handicapped. I made an oath to her. The next day she died—the next day!” He also promised her that he would devote half of all the money he made in his life to charity. So how does a poor orphan from Middlesex end up owning a 87-amusement park that nobody ever pays to get into? The answer to that question is a real rags-to-riches tale that The Greek clearly relishes in telling. As a young man he borrowed $500 to buy his first pick-up truck, a shovel and a rake and started his own landscaping business and over the years he continued to garner an increasingly wealthier clientele. Soon he became the landscaper of choice for the rich and famous, include customers like Jon Bon Jovi. 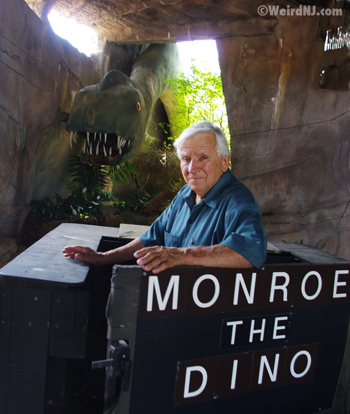 His fortune made, The Greek set out in 1970 to make his solemn vow to his dying Mom a reality when he purchased 87 acres of what was essentially swampland in Monroe Township and began to transform the property into the wonderland that we see today. 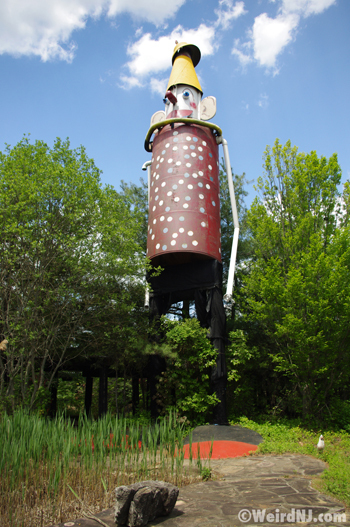 Then he set about building all the weird and wacky attractions that his whimsical heart desired. And every inch of the park was barrier free and wheelchair accessible. Then he opened the gates to share his Playland with those less fortunate than himself––free of charge, taking in State and locally sponsored groups. Generally The Greek never participates in these events himself, preferring to revel in the joy he brings and happy faces of the kids from afar. To date more than 100,000 children and adults have visited the Playland, according to Greek. The last two years have not been kind to him. He’s suffered two strokes, been diagnosed with diabetes, and had hip surgery. But while his physical challenges may have slowed his step a bit, they have done nothing to diminish his spirit. 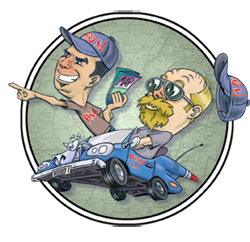 He’s been retired from the landscaping business for eight years now, and admits that money is sometimes tight, since the Playland was never open to the public as a recreational park and he has never charged his guests anything at the charity events. Private weddings now fund the place––there are three separate banquet halls, which can accommodate 120, 300, and 500 guests. It was great to see this enigmatic joy giver work his magic on the kids the day that we visited the Playland and we got the impression it was a day that they would never forget. And with that, we took our leave of Greek’s Playland and the kindly old elf who dreamt up this uniquely weird Technicolor wonderland all his own, and would generously share it only with the people who truly needed it the very most. Mom would’ve been proud. 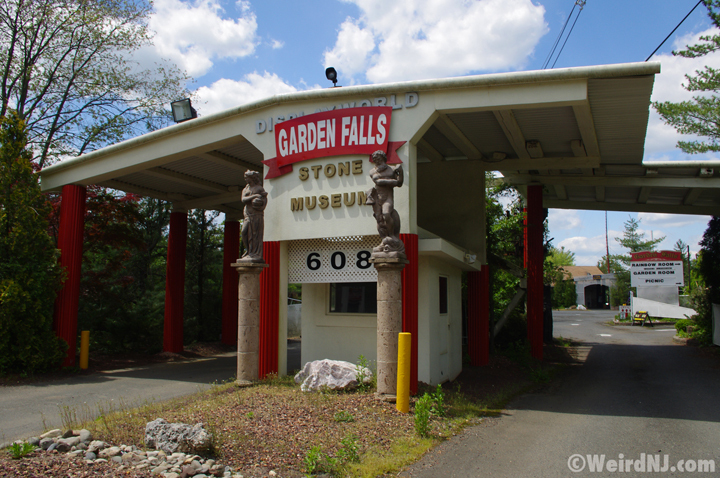 Garden Falls and the Stone Museum are located at 608 Spotswood-Englishtown Road in Monroe Township. 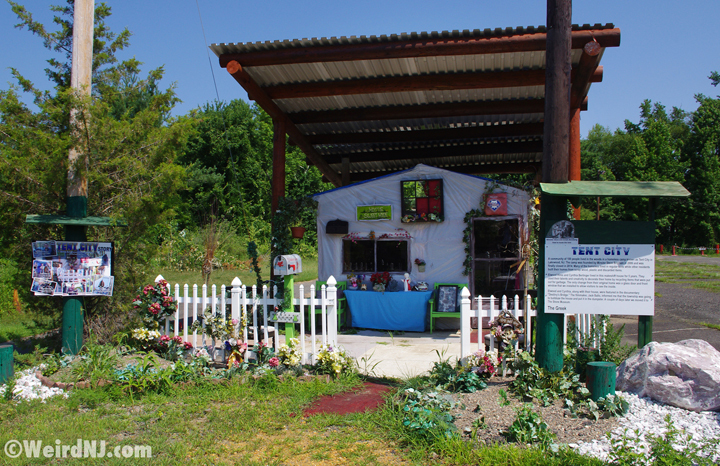 Visit them online at www.gardenfalls.com. 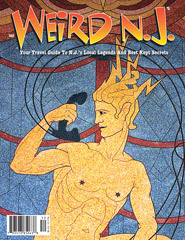 The preceding article is and excerpt of a full-length feature found in the current issue of Weird NJ magazine, #43, which is now available on newsstands throughout the state and on the web at www.WeirdNJ.com. One of the newest additions to the Playland is the tent that Elwood Hires and Cynthia Berlinger lived in for five years during their occupation of Tent City community in the woods of Lakewood. 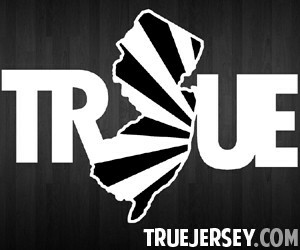 (See Weird NJ issue #42.) When The Greek was told that the township planned to bulldoze the beautifully appointed makeshift residence, he had the entire home transported to Monroe where it was lovingly reconstructed inside and out and put on display for visitors to see. 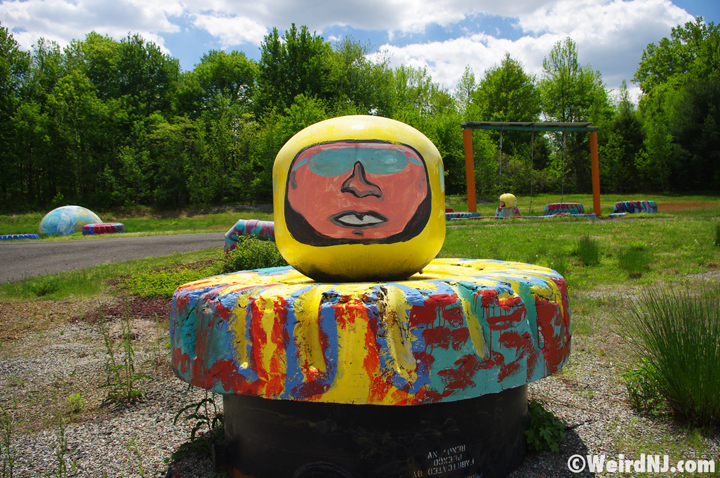 This entry was posted in Roadside Oddities and tagged amusement parks, clown, display world, garden falls, greek, Greek’s Playland, jamesburg, middlesex county, Monroe, stone museum, tent city, tire field. Bookmark the permalink.